Sometimes you get to work on a project that expands beyond the specific world in which the design problem is set. 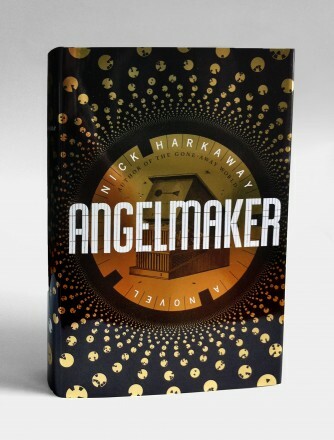 The jacket for Nick Harkaway’s Angelmaker has been one of those for me. And it allowed me to delve into something I was obsessed with growing up—coded language. I suppose everyone passed coded notes back and forth with a friend in grade school, and possibly in high school you developed signs and signals that would allow for silent communication across a classroom. But how many of you spent an entire college summer encrypting and decoding love letters that got so complex it took days to crack the system of each new communication. I have one of those at my desk now, and though I have spent a few hours (with the of excuse of research for this book jacket) I can no longer read it. 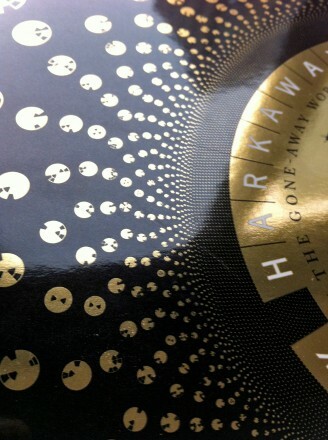 Anyway, I have been very lucky to design the book jackets for Harkaway, because he is one of those special writers that is doing something different. His books are hard to classify. They are literature, for sure, but they swim through many genre currents before emerging as their own peculiar creatures. His latest novel Angelmaker, released a few days ago in the U.S., fills a diesel punk world with super spies, London gangsters, intricate clockwork mechanisms, genius engineers, and an evil evil mastermind. What all this means, is that I get to make strange and unusual jackets for his books. Or, more correctly, I need to make strange and unusual jackets to package his books well. The first one was fuzzy. This one has a code. Those little foil disks can tell you something, and can lead you somewhere. There are clues on the physical jacket to help, and I’ll take the first Parsons student to email me the name of the entrance to lunch. So why put a code on it? A jacket has to do a number of things to be successful, but one of them is to be attractive. And attraction, can take a number of forms. In this case, the previous knowledge of the existence of the code, was one of the intended marketing hooks. But not a shallow tricky one. Just like the layers of Harkaway’s storytelling, this code is complicated. Codes and alternate reality games are not new by any means, but again this one adheres to the themes of the book, and surrounds it with a certain vein of Pynchonian madness. Will this draw more readers to the book? Did it cause booksellers to care more about this title? Time will tell. But regardless, the time and effort was well spent if the plain and simple extra-ness adds to the foundation of who Nick Harkaway is as writer. I obviously believe he is one well worth reading. One point I want to make here for young designers and students, is that you can always redefine, and enlarge, or re-imgaine a design problem. If all these assignments you get in class seem limited by their time constraints, or by the fact that everyone is working on the same thing, take it on yourself to change the assignment, in or out of class. I always encourage my students to own any design problem they are given. As a student it’s actually easier to shift the problem. But even once you start working for a client who isn’t yourself, part of bringing something special to the solution you present has everything to do with seeing the problem from a different angle. I’m pretty sure my students always ask themselves, what am I supposed to do, or what does he want me to do. I hope they do, because it’s an important part of the design problem of any classroom assignment. But what I really want, is for them to take the step beyond that and ask themselves what they can (in the extreme sense) do. How can they make the problem different from its original conception, or simply make it more interesting to themselves. Because then at least, even if it’s not the most innovative solution, it will have a soul. Jason Booher is a senior designer at Alfred A. Knopf and part-time faculty at Parsons the New School of Design.